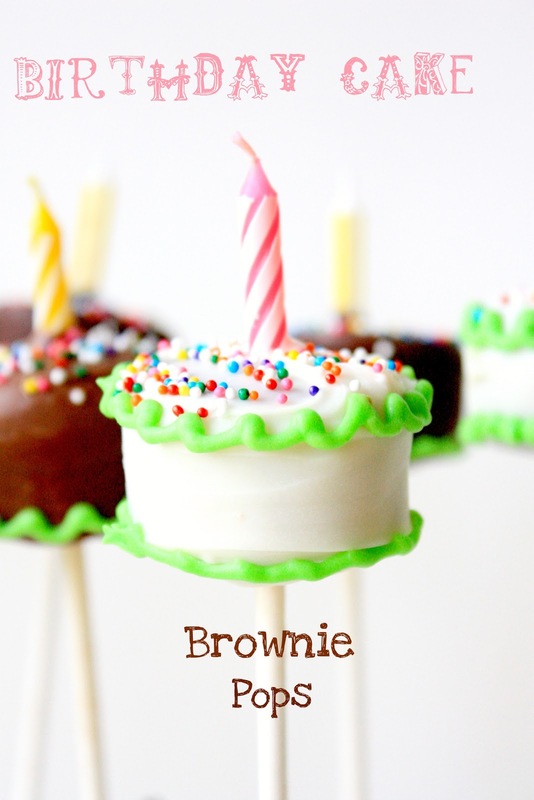 My daughter-in-law has a birthday coming up:) She's a big fan of my brownie pops, so I wanted to make her some special brownie pops to help her celebrate. 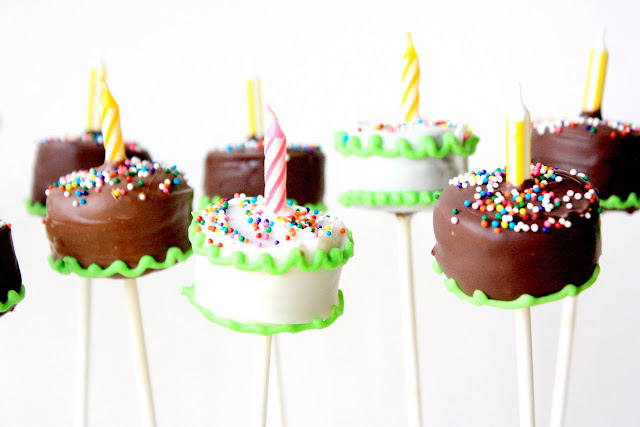 When I saw these adorable mini cake-cake pops, I knew I had hit on the perfect pop! Didn't Strawberry-Chic do a fabulous job? Gather a ball of baked brownie mixture and make it into a small patty. Use a 1.5-inch round cutter (I used a biscuit cutter) and cut out a round mini cake. Place it on a wax paper lined baking sheet. Insert a lollipop stick (the tip of the stick should have some melted candy on it to help it stay put) into the middle of each pop Once they are all prepared, place in the freezer until firm. Working with one at a time, take from freezer and dip each cake into the melted candy melts (melt as pkg. directs) and let excess drip off (I also used a small offset spatula to smooth the top and around the entire pop if it needed it). 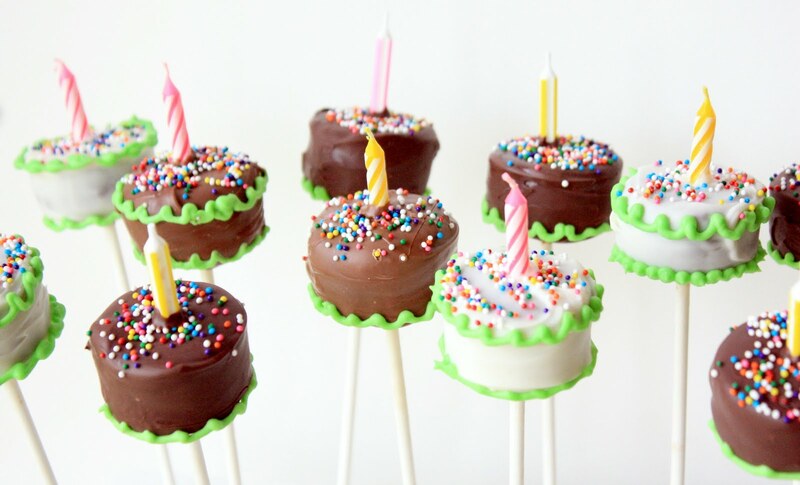 Shake the sprinkles on the top of the mini cake and place the candle* before the candy coating dries. You may need to add some candy melt to the bottom of the candle before placing it on the pop. Prepare some royal icing to decorate the cakes. I used royal icing so that I could individually package these pops without a mess(after the royal icing dried). * For candles I used a sharp knife to cut regular sized birthday candles down to size. Make some of your own and see for yourself! I so heart these! Absolutely adorable! Very cute, I bet she will love them! So adorable,she will love these! Adorable! Those are sure to make anyone feel special, Sue. Love, love, love! Sue these are just too adorable for words. I agree they would be spectacular with the candles lit. SUE, these are SOOOOOOOOOOOo cute! I am in love, but I just don't have the patience for pops. Bless you and your patience, these are amazing! These are adorable! I like your use of brownies rather than the cake/frosting mixture to make the pops. I've never had the latter but I think the sweetness (taste) factor would be over the top. And brownies are so much yummier! These look so adorable! I love the sprinkles and candles on top...(a much more creative way to make sure people know they really are cakes...rather then writing "cake" on top like I did, haha :)! Would you say that the brownie bites are tastier and easier to work with then cake pop batter? These are absolutely adorable! Are they really raw dough and not cooked brownie? I can't wait to give it a try! When you look at a picture and say Ooooo that looks good. That's when you know it's the perfect recipe for your link party :) I'm hosting a recipe only party Cast Party Wednesday and would love it if you came by and shared some of your recipes with us. I Love these! I can just imagine how cute these would be in a centerpiece. So much fun. I LOVE these!!!!! They are SOOOOO cute. I am going to have to try these. TOO CUTE!!!! Love,Love, love how cute these are!!!! I've never seen a most beautiful thing like these cake pops, except your children, they are adorable!!! Ahh yet another adorable product! What's next on a stick? Tiramisu? Please! Those are absolutely adorable. I think they're my favorite one yet! Seriously Sue! I'm going to have a pinterest board dedicated just to your fabulous projects and recipes! These are beyond adorable!! Thank you for sharing them (and all of your fabulous ideas)with us at Inspiration Friday! We think you are pretty special! Another really cute idea that is perfectly executed. So fun! These are super adorable! I saw them at the source too -- your version looks just as fantastic =D. My goodness, they are so adorable! I'm trying to find the words but all I can say is...WOW WOW WOW! These are so, SO SO! cute!! Wow! Those are so adorable! How lucky is your daughter in law?!?! Cutest things ever!!! I love them! I'd like to invite you to share on A Well-Seasoned Life's Sweet Indulgences Sunday. these are the cutest things I have seen in a long time! Love them! These are PERFECT!! Wow, they make me smile, so adorable. You must have incredible patience!!! These are oh-so-cute!! Hi! These look adorable & delicious! omg!! these are so cute!! my niece has a bday soon and I know she would love these!! EEEK!! I love these. They are so so cute!!! OoOo discovered your site from the link up on 33shadesofgreen! Your talent simply blows me away. If you made these ahead of time then froze them(decorated) then thawed before the event, do you think they'd crack? I'd like to make them for my son's first birthday, but I'm dong the cake too and don't want to attempt too much all at once. Robin, I've never frozen the pops after I've dipped them. I'm not an expert, but don't think that would be a good idea. Actually, I've made the pops a week in advance before and the candy melt coating seems to seal in the freshness of the brownie(or cake). I've experienced no problem at all with doing that. I store them in a Tupperware type container and/or in individual bags tied with a ribbon. Good luck and have a fun party! Love the mini cake shaped pops, perfect for any aged birthday! Why couldn't you use the brownie bites that you see in the grocery store and save yourself time molding each one. They are already the shape of mini cakes. So so cute,I love to try,but may be I am thinking too far ;) But yours tempts so so much!